There were rumours that so-and-so had a bootleg copy of it on VHS. Someone else claimed their older brother had seen it in France on a school trip. For 27 years it was difficult for anyone in the UK to get hold of a copy of Stanley Kubrick’s 1971 dystopian thriller, A Clockwork Orange. Thus for those of a certain generation it had a big mystique: the monochrome imagery, the weird name, the violence. We all wanted to see it, but we couldn’t. Even the fact that it had been withdrawn at the director’s request added to the intrigue, as if Kubrick himself had realised what he’d made was dangerous. When it was eventually re-released after his death in 1999, it didn’t exactly feel like the film we’d been waiting for. It wasn’t that the movie seemed dated (it did, but in a good way) or even that its depiction of ultraviolence had been surpassed by modern standards. It was more that the message and style of the movie jarred so much. And it didn’t seem to fit with a reputation that had taken root after the supposed copycat crimes of the early 70s. It wasn’t a brutal video nasty, it was brilliant cinema. It’s no surprise that a director with Kubrick’s arty eye for detail would make a film that looks so visually appealing, but it’s still a weird way to make a point. How can such a grim world look so amazing? From the 60s kitsch of the King’s Road record store where Alex picks up those girls, to the Korova Milk Bar itself (every mod’s dream nightclub), the film’s setting is pure retro charm. Despite everything else, Malcolm McDowell’s Alex is handsome, charming and cool as hell. This Brighton Fringe event is a great chance to see the film on a big-ish screen with the added frisson of witnessing the crime and punishment unfurl in a former Victorian seat of law. The screening is followed by a Q&A with the owners of the Skybreak building, the luxury modernist home in which Alex does the deed. 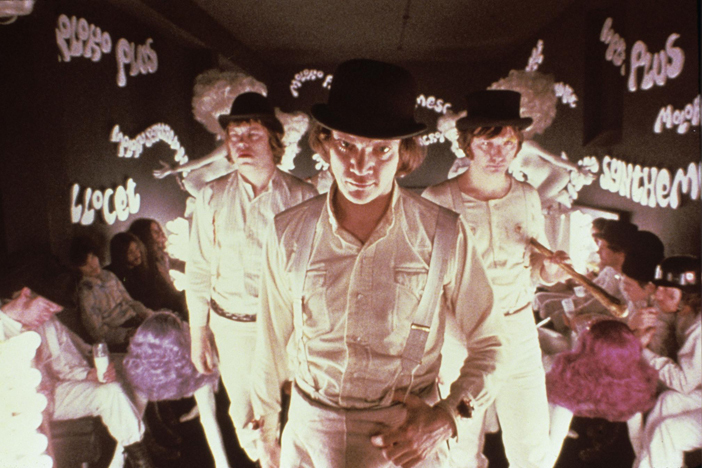 Some people will probably dress up as droogs, and why wouldn’t they?